When considering life insurance needs, most people will automatically think about young families who are protecting income and other financial requirements of those who count on them. Once someone reaches a certain age, many people may feel that there is no longer a need for this type of coverage. Yet, the truth is that, even for those who are seniors, there is a wide variety of reasons why life insurance coverage is not only important - but may even need to be added later on in a person's life. And the good news is that the price of this coverage may not be as costly as you might think. Unlike many years ago, those who are in their 80s today can be much more active. Due in large part to advances in medical technology, people are living much longer nowadays - which is good news for both consumers and life insurance companies alike. It also means that there are a number of reasons why life insurance coverage can still be important later in a person's lifetime. First, while most retirees several decades ago may have had their large expenses such as the mortgage, car payment(s), and other debt obligations all paid off - today, that isn't necessarily the case. Longer life spans means more life ahead of us, and therefore, the purchase of big ticket items later in life. Along with these expensive items will oftentimes come debt. Unfortunately, though, if the borrower passes away, he or she could leave their loved ones in a financial bind. Having life insurance proceeds available to pay off these debt obligations can help to ensure that this doesn't occur. Many people who are in their 80s are also retired - and this means they are likely living on some type of pension or other type of retirement income. In many cases, though, in the case of a married couple or partnership situation, at the death of one, a substantial income source may stop for the survivor. This could put the survivor into an immediate financial hardship, with no way of paying his or her ongoing bills going forward. Here again, having life insurance proceeds available to that survivor could allow the survivor a way to replace the lost income, without having to drastically change or reduce their lifestyle. In addition, no matter what age we are, when the time of our passing comes, it is probable that we will all have at least some amount of final expenses. Unfortunately, loved ones are often asked to pay for these at the time of service. Today, the cost of the average funeral and related expenses in the U.S. can be more than $10,000 when you factor in items such as a headstone, burial plot, flowers, and transportation for the memorial service. The proceeds from a life insurance policy can help loved ones to ensure that the money for final expenses does not have to come out of savings or other assets - or worse yet, so that a surviving spouse or loved ones do not have to put them on credit. For people in their 80s, there are several options for life insurance coverage - and some of these can provide you with protection within just a matter of days, or even hours, should you opt for them. For example, with a no medical exam life insurance policy, there is no medical related underwriting to contend with. This means that you won't be asked to submit a blood or urine sample as a part of the underwriting process. Therefore, the application process can go much faster than it does with "traditionally underwritten" life insurance policies. In fact, with a no medical exam life insurance policy, you cannot be turned down for coverage due to your health issues. The face amount of coverage on these plans can vary, but oftentimes, you can obtain coverage of between $5,000 and $50,000 - and depending on the specific carrier, the amount could even be more. Many people who are in their 80s will consider the purchase of final expense life insurance. These policies - often also referred to simply as funeral insurance or burial insurance - are sold for the purchase of paying for funeral and related expenses. These can provide you and your family with the peace of mind in knowing that the high cost of final expenses are taken care of and that your survivors will not have to dip into savings in order to get them paid. Life insurance for people in their 80s could be sold either as term or permanent coverage - although your options for term plans may be limited. With term life insurance, you will obtain death benefit only coverage, with no other savings or investment options connected to the policy. Permanent life insurance policies offer both death benefit protection, along with a cash value component that allows for tax-deferred build-up of the funds inside. Over time, these funds could grow to a significant amount - and, the policyholder is allowed to either borrow or withdraw these funds for any reason at all, such as paying off debts and / or supplementing retirement income. The cost of life insurance for those in their 80s can vary, depending on the amount and type of the coverage that is chosen, as well as other factors such as the age, gender, and potentially the health condition of the insured. For example, on a traditionally underwritten term or permanent life insurance policy, you could be deemed as a Standard policyholder. If this is the case, then your premium would be in line with that of others who are considered to be of "average" health who are also in your similar age and gender category. If, however, it is deemed that you have some health issues - but these are not serious enough to decline you the life insurance coverage - then you could be placed into a substandard policy class. Here, you would have coverage, but the premium cost of that coverage would be somewhat higher than that of a Standard policyholder. For those who purchase a no medical exam life insurance policy, because these individuals are usually considered more risky to the life insurance carrier due to certain health related issues, the premiums that are charged on these types of higher risk policies are typically higher than those of regular policies. However, for someone who is in their 80s, this type of coverage could provide the only way to obtain the coverage that is needed. When shopping for senior life insurance, it will be important to work with either a company or an insurance agency that has access to more than just one life insurance carrier. This way, you will be able to compare multiple different options all in one place, and to then determine which will be the best one for you and your specific needs and budget. This can be important because, what many people may not realize is that not all life insurance companies price their products in an identical fashion. This means that if an 80-year-old applicant applies at one carrier for coverage, he or she could be deemed as a Standard policyholder, while, at another, they could be considered a Substandard - even with the same information on the application for coverage. Therefore, it certainly pays to compare before making your final determination. Doing so through a company that already knows which companies are more apt to accept applicants in their 80s can help - and can also save you a considerable amount of time throughout the insurance application process. So, when you're ready to begin shopping for life insurance, we can help. We work with many of the top life insurers in the marketplace today, and we can assist you in obtaining all of the important information that you need. When you're ready to get started, get your first set of quotes by filling out the form on this page. If you should determine that you have any additional questions or concerns regarding finding life insurance in your 80s - or even if you just have questions about life insurance in general - please feel free to give us a call. We can be contacted directly via phone, toll-free, by dialing 877-235-9299. 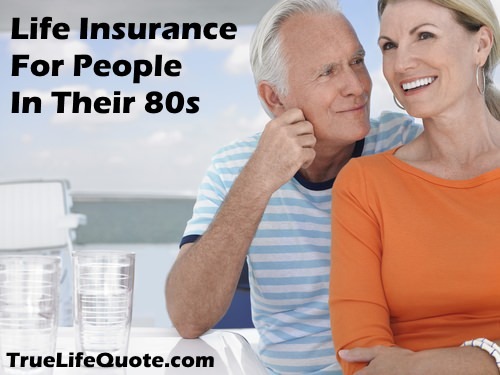 We understand that shopping for life insurance in your 80s can bring up some concerns. You want to ensure that you will qualify, and the cost can be a factor. But the good news is that you have many new options that are open to you today - and we can help you to find them. So, contact us today - we're here to help.